Description - This chicken-like bird is a red-brown or grey-brown with a slight crest, a fan-shaped, black-banded tail and black "ruffs" on each side of the neck. 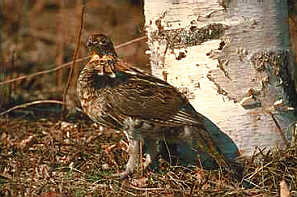 The female makes soft hen-like clucks; in the spring the male beats the air with it's wings creating a drum-like sound. Distribution - The grouse's natural habitat is in deciduous and mixed forests, especially in those with dense undergrowth and scattered clearings. They occur from the tree line of Alaska and northern Canada south throughout our country. Biology - During the summer the grouse feeds on insects, seeds, fruits and sometimes, a small snake or frog; the winter diet is much more limited consisting of buds and catkins. A shallow, sheltered depression lined with leaves and filled with 9 to 12 pinkish-buff, plain or spotted eggs characterizes the nest.